Lori Theriault creates functional pottery that wants to be touched and used. Texture, both tactile and visual, informs her work. Her work originates on the wheel and sometimes from the slab, and she uses non-toxic clays and glazes. Her designs are inspired by the community that surrounds her, both in nature and the human forms, and with how various pots fit into daily life. And like families and friends, many share traits and characteristics, but each has the definite mark of the maker and an individual personality. Lori makes work for home and professional kitchens, and her work is durable to last through family dinners and busy dinner services. ​Born in Vermont, Lori has been semi-nomadic in address and in career, having worked as a stage manager, innkeeper, restaurant manager, and office manager in Atlanta, Chicago, and Washington DC. She began her clay studies in Washington, DC in 2001 where she studied at Hinckley Pottery. After seeing slides of western North Carolina during a visiting artist workshop, she knew that's where she wanted to put down her studio roots, and she relocated to Asheville in 2006. 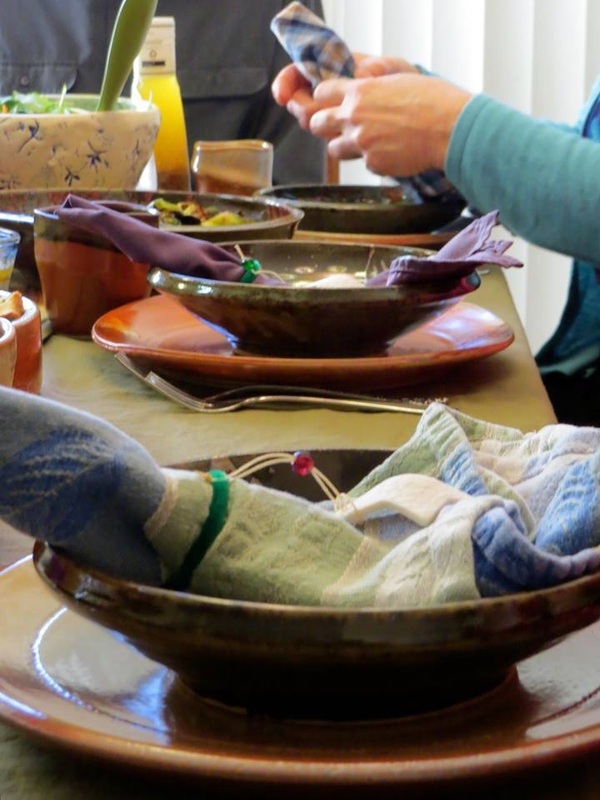 She completed a two year Resident Artist Program at the Odyssey Center for Ceramic Arts and then opened Crazy Green Studios, a working and teaching studio, in West Asheville. 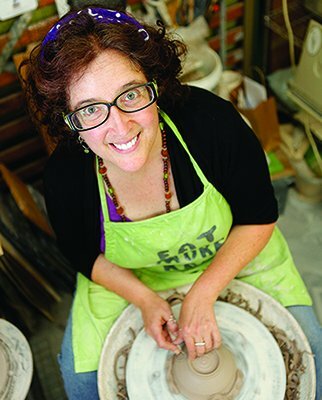 Crazy Green Studios now happily resides within The Village Potters Clay Center, in Asheville's River Arts District, where she is the Marketing Director and serves as a mentor in their Independent Study & Mentoring Program. Her work is sold in The Village Potters Gallery, in regional galleries, and in a variety of shops. She also designs and creates branded pottery for a number of businesses based in Asheville, and creates custom service ware and accessories for restaurants and food professionals throughout the region. Homemade: "made or prepared at home, or by the maker's own efforts." This includes wild concoctions inspired by random ingredients as well as divine multi-course sensory feasts. The maker could be a chef or just someone who loves food, from the look of a seasonally ripe vegetable to the aroma of freshly pinched herbs to the sound of a just right sizzle, and of course the taste. It's mostly small batch, done in a personal kitchen, but it could also be a small business that manages to keep the love inside each bite of what they serve in restaurants or pack into containers. It doesn't travel very far, if at all possible, and it involves seasonal ingredients. Every grain, leaf, teaspoon, pinch, and drip of goodness is touched by the maker, and the whole is a reflection of that heart and soul. Handmade: "made by hand, rather than by machine." Pretty simple, and yet not simple at all. A wheel thrown bowl involves the combination and coordination of materials, physics, and aesthetics. It must survive the making, the trimming, the drying, the firing, the glazing, and then the firing again. Again the maker has touched every grain of clay, a thousand times over. And just as the heart and soul of the cook is evident in every bite, so the heart and soul of the potter is evident in the look, the touch, and the feel of every piece of pottery made. When you put your heart and soul into making a meal or designing a menu, you want the dishes you use to be worthy of that meal. And when you make or use beautifully crafted, handmade pottery, you want the food to be worthy of its creation. Life slows down when you sit at a table, in good company, and find it set with handmade lovelies that are laden with homemade love. Homemade just tastes better on handmade. I'm sure you've heard, and I'm sure I've used, most variations of "It takes a village to ...". It's true - very little that is accomplished, by anyone, in my opinion, happens alone or without collaboration and/or assistance. My path to The Village Potters may seemed to have come relatively quickly to those just glancing in, yet it seems to be what I've been working toward for years. And to take advantage of this incredible opportunity, I turned to my own community - my village - of friends and supporters, and the support has been overwhelming. I have had tremendous support throughout my clay career, and no doubt there are many people who should also be on this list for past support, but special thanks go to this list of friends and supporters who have specifically helped me join The Village Potters, and who continue to support my work today. I am forever grateful.